The internet is in love after transgender Antifa personality Christine Chandler decided she’s had enough of nazis in her My Little Pony and uploaded a savage take-down featuring gratuitous Christmas tree dismemberment. 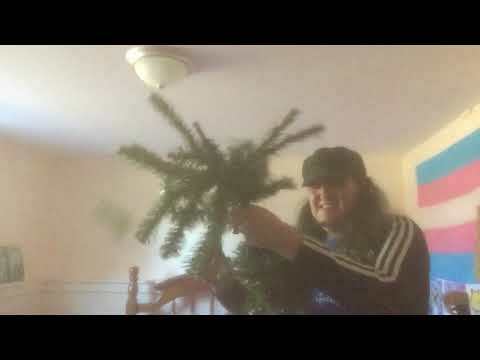 Christine then picks up the seasonal decoration and grunts as she meticulously strips it of its little plastic limbs over several beautiful minutes. Having destroyed the tree, the activist once again proclaims her just cause. “My brothers and sisters of Antifa, we will show you freakin’ nazis: get the hell out of Equestria now!” We also learn that her favorite wrestler is Chris Benoit. Equestria is the setting of the My Little Pony: Friendship is Magic cartoon franchise, which is widely considered a safe space fandom for transgenders, atheists, liberalists, and other marginalized communities. It is not known at this time if the video was sparked by a specific incident or just general frustration with ponies in SS uniforms. It’s true, Nazis currently have no place in MLP, that’s why we will lebensraum it as well, SIEG HEIL, ARYANNE! Shut the f up about stuff you have no idea about. It’s a fandom like any other and you hate no right to judge especially since MLP is based on friendship instead of violence so why do you have such an issue? You shut the gently caress up trying to defend a fandom of creeps! Grown adults shouldn’t be watching poopy that’s made for little girls. God Bronies are creepy as poopy! You gently caressing creeps hijacked a cartoon made for little girls. You people wonder why you’re still single and still virgins ? Well it’s because women don’t find pussies who watch cartoons for little girls attractive. They think you’re creepy fat pedos! Nazis have no place in My Little Pony. Thank you for standing up for us, Christine. Hysterical mob targets Pewds after Ben Shapiro guests Meme Review The more ambitious crossover event than Avengers: Infinity War earns wide acclaim — and deranged diatribes.